The Acer Chromebook R11 is a great looking 2-in-1 device that offers decent performance at an affordable price. The Acer Chromebook R 11 is a 2-in-1 device that works as both a laptop and tablet, and it’s actually pretty comfortable to use in both modes. It hits the right marks in terms of both design and performance, although it is a bit heavy to use exclusively as a tablet for long periods of time. 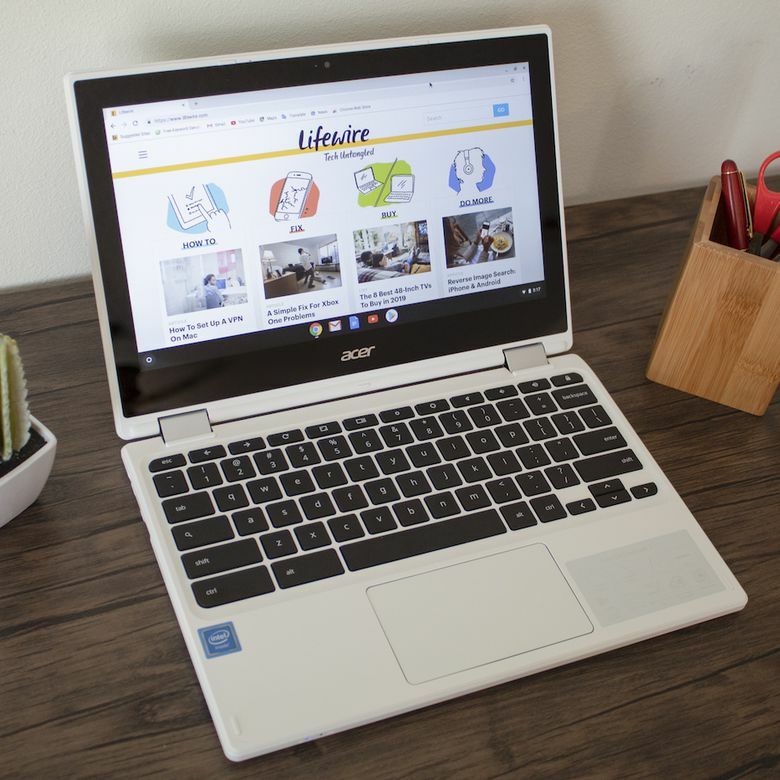 Since the budget Chromebook market is flooded with so many choices, and choosing the right one can be so tough, we took an Acer R11 and put it through the wringer both around the office and at home. Most inexpensive Chromebooks hew to a handful of safe design choices, including colors like basic black and gray, which sets the design of the Acer R11 apart from most of the competition. This Chromebook is still largely made of plastic, which is common for devices in this class, but it includes a textured metal insert on the lid that gives it a unique look. The body of the R11 is entirely white, with a pleasantly textured plastic bottom case to match the metal inlay on the lid. It also has a slightly more angular look than a lot of other Chromebooks without appearing boxy. The unit is held together by two beefy hinges that allow the screen to fold all the way around, converting the Chromebook into a tablet mode. The R11 actually chalked up better Wi-Fi download speeds than a much more powerful desktop tested at the same time. When folded into a tablet, the lid and case fit together well without any unsightly gaps. The hinges are also stiff enough to hold the screen at any angle, allowing you to use it in a tent mode as well, but they’re smooth enough that it doesn’t take much effort to switch between modes. As a tablet, the R11 is more ungainly than devices that function solely as tablets. However, in comparison to other 2-in-1 devices, the R11 is very usable in both modes. It’s a bit heavy to use as a tablet all day, but it’s light enough, and comfortable enough to hold, that occasional use as a tablet is unlikely to present any trouble. The R11 includes a full-sized HDMI port, a USB 3.1 port, and a full-sized SD card reader on one side, with a USB 2.0 port and an audio jack placed on the other side. Aside from those ports, and the speakers, the case has no other openings or vents. This is enabled due to the fact that the R11 uses a passively-cooled, fanless design, that results in both silent operation and less power consumption. Since the Asus R11 is a Chromebook, the setup process is just about as painless as it could possibly be. In fact, it’s almost ready to go the moment you take it out of the box. Setting the R11 up involves turning it on, waiting for it to boot, and then connecting to your Wi-Fi network. Once you’re connected to your Wi-Fi network, all you have to do is log into your Google account. The device is then ready to use. With two-factor authentication enabled, it still took us less than two minutes to go from turning the R11 on for the very first time, to arriving at the desktop. At that point, the device is ready to use. However, you will have to download an install a system update the first time you shut the device down, and you’ll also have to download and install any apps you need beyond the basics like Google Docs. The Acer Chromebook R11 has an 11.6-inch IPS touchscreen display that features a native resolution of 1366x768. That’s a little low in terms of resolution (1920x1080 is sharper), but it’s also very common for Chromebooks of this size. While the screen can feel cramped at times, the small size means that the pixel density is still high enough to look very nice. Since it uses an IPS display, the viewing angles and color depth are both great. The screen looks really nice in both laptop and tablet mode when used indoors in all kinds of light levels, although the brightness is low enough that it becomes a little more difficult to see when subjected to bright natural light. The display really suffers when you take it outside, not because of any lack of brightness, but due to the reflectivity of the screen. The screen is so glossy that it’s almost impossible to use outdoors, in full sun, without reflections completely blocking everything. The R11 achieved a score of 5578 in the PCMark Work 2.0 benchmark test, which was the highest result we saw out of a slate of Chromebooks with similar hardware. Work 2.0 is a benchmark that tests how well a computer is able to handle a variety of basic tasks like word processing, video editing, data entry, and more. We also subjected the R11 to a couple of GFXBench graphic benchmarks, even though it isn’t really designed for games. It wasn’t able to run the standard Car Chase 2.0 benchmark, so we subjected it to the OpenGL Aztec Ruins test. It only achieved 10.9 FPS in that test, which isn’t surprising given that it uses the same Intel HD Graphics 400 (Braswell) chip found in a lot of lower end Chromebooks. In our hands-on testing, we found that the R11 is snappy and responsive when performing most tasks, including word processing and streaming video. The next benchmark we ran was the GFXBench OpenGL T-Rex test, which it handled a whole lot better. The R11 managed an acceptable 36.6 FPS in this test, which was on the higher end of results that we’ve seen from similar hardware. In our hands-on testing, we found that the R11 is snappy and responsive when performing most tasks, including word processing and streaming video. It tends to bog down when a large number of tabs are open in the web browser, typically around 10-15 tabs, but it remains usable. Since the Acer R11 is a Chromebook, it’s designed primarily around tasks that can be accomplished through a web browser. For basic productivity tasks like word processing and data entry through Google Docs, web browsing, and streaming video, it’s great. If you need any specialized programs, your productivity may suffer. The keyboard is great, with nicely spaced keys that don’t feel mushy or overly shallow, so typing for long periods of time is no problem. The touchpad feels a bit loose, but it’s usable, and you always have the touchscreen as a backup. If any part of your daily workflow benefits from switching into tablet mode, they’re both highly usable as well. The transformation is seamless both mechanically and in terms of Chrome OS flipping the display, and great viewing angles mean that you can easily share information with others.The R11 isn’t a direct laptop or tablet replacement, but it won’t get in the way of getting the job done. The Acer R11 features stereo sound, and the speakers are located toward the front, and at the bottom, of the case. The sound is decent enough for a Chromebook of this size, and in this price range, to the point where you can actually listen to music and stream videos without plugging in headphones. Vocals come through clearly when listening to music, and the bass response is about as good as you can expect from such small speakers. The audio does get muffled if you set the laptop on a soft surface, like a couch or your lap, because the speakers fire down instead of up or to the side. There’s no ethernet port, so you’ll need a Wi-Fi network or a USB-to-ethernet adapter to connect to the internet. The good thing is that it has great Wi-Fi connectivity. The R11 actually chalked up better Wi-Fi download speeds than a much more powerful desktop tested at the same time, and it exhibited no dropped connections or other issues during our testing. The R11 managed blazing fast download speeds of 335 Mbps, and upload speeds of 60 Mbps, when tested in close proximity to our router. By way of comparison, a desktop tested in the same location, with the same Wi-Fi network, managed 212 Mbps down and 64 Mbps up. The same desktop, when connected via ethernet, achieved download speeds of 400 Mbps. When moved away from the router, the R11 held steady in terms of download speeds with its Wi-Fi signal at about 80 percent. Further away, with the signal dropped to about 50 percent, we saw a significant drop off in transfer speeds to just 80 Mbps down. The R11 has a front-facing 720p webcam that’s sufficient for personal video chat, but may not be up to snuff if you need something for professional video conferencing. The color reproduction is fine, but there’s a lot of visual noise, and pictures taken with the camera come out noisy. Battery life is a weak point for the R11, but it’s still decent enough for most purposes. To test the battery, we ran the R11 through PCMark’s Work 2.0 battery test, which performs a continuous series of productivity tasks, like web browsing and video streaming. This is a lot more intense than most normal usage, so it gives you a good idea of a worst case scenario. During this test, we found that the R11 battery lasts about seven hours. The screen looks really nice in both laptop and tablet mode when used indoors in all kinds of light levels. We also used the R11 as a normal laptop, performing regular tasks like word processing, listening to music, and watching online videos, to see how it fared in real use. We found that in those conditions, the battery lasts about nine hours before needing a charge. That’s shorter than a lot of ultraportable Chromebooks, but it’s still long enough for a full day of work or school. The R11 is a Chromebook, which means it uses the Chrome operating system. This is a lightweight operating system that lacks a lot of the capabilities found in Windows and MacOS. You can dual boot a Chromebook with the Linux distribution of your choice, but that requires some technical customization that not all users will be comfortable with. Chrome OS is kind of like the Chrome web browser with some extras to make it functional as an operating system. Out of the box, you’re limited to Google’s suite of web-based apps, like Google Docs. Other tasks, like editing images, can be achieved through web apps like Pixlr. The R11 is also compatible with Android apps, which you can download through the Chrome Web Store. Some apps aren’t 100 percent compatible, but the availability of Android apps does help bring the functionality of the R11 closer to that of a Windows or MacOS device. The Acer Chromebook R11 has an MSRP of $299, which is a decent price for what you get. It has a more attractive design than a lot of laptops and 2-in-1 Chromebooks in that price category, and the performance is also in line with competing models that cost a similar amount. If you don’t need the tablet functionality, you can save some money by going with a Chromebook laptop. You can also spend a significantly larger amount of money to bump up to a premium Chromebook, but you won’t find a much nicer device at this price. The R11 is one of the nicer looking Chromebooks you’ll find in its price range, and it also stacks up favorably in terms of performance. For example, the Dell Chromebook 11 3181, in its most powerful configuration, has a similar price. The R11 beats it both in performance and style, but the 3181 is a little bit more durable due to the addition of rubber edges. Another competitor, the Samsung Chromebook 3, is also in the same price range. It looks more professional than Dell 3181, but it has a very basic design that doesn’t work as well in tablet form. It also lacks the full-sized SD card reader that the R11 features. Check out our other top picks for the best laptops for kids available today. One of the better looking—and performing—Chromebooks in its class. If you’re looking for a small Chromebook in this price range, and you think you’d get some utility out of the tablet modes, the Acer R11 is an excellent choice. The battery life is lower than some of the competition, and it’s a little heavy to use as a tablet all day, but it looks and works great. Product Dimensions 8 x 0.8 x 11.6 in.